Economist Films: For 20 years The Economist has led calls for a rethink on drug prohibition. This film looks at new approaches to drugs policy, from Portugal to Colorado. “Drugs: War or Store?” kicks off a new “Global Compass” series, examining novel approaches to policy problems. Portugal decriminalised the use of all drugs in 2001 and according to Der Spiegel, one gram of heroin, two grams of cocaine, 25 grams of marijuana leaves or five grams of hashish are the drug quantities one can legally purchase and possess in Portugal, carrying them through the streets of Lisbon in a pants pocket, say, without fear of repercussion. MDMA — the active ingredient in ecstasy — and amphetamines — including speed and meth — can also be possessed in amounts up to one gram. That's roughly enough of each of these drugs to last 10 days. Portugal has stopped prosecuting users but the drugs are still illegal to avoid hassle from the UN while using these drugs above the 10-day limit "is nothing more than a misdemeanor, much the same as a parking violation." Der Spiegel says there were about 100,000 severely drug-addicted people in Portugal in the mid-1990s. Now it has one of the lowest overdose deaths in Europe and with the exception of cannabis, the demand for other illicit drugs has fallen. The European Monitoring Center for Drugs and Drug Addiction (EMCDDA) has its headquarters in Lisbon and it published its latest annual report this month. 3.4 % of all deaths of Europeans 15–39 years old are drug overdoses, opioids are found in 66 % of fatal overdoses while overall, "drug overdose continues to be the main cause of death among problem drug users, and over three-quarters of overdose victims are male (78 %). While it is often the deaths among the very young that generate concern, only 8 % of the overdose deaths reported in Europe in 2013 were aged under 25 years. Between 2006 and 2013, a pattern can be observed of decreasing numbers of overdose deaths among younger drug users and increasing numbers among older users. This reflects the ageing nature of Europe’s opioid-using population, who are at greatest risk of drug overdose death." The report says for 2013, "the average mortality rate due to overdoses in Europe is estimated at 16 deaths per million population aged 15–64. Northern Europe has the highest rates. In Portugal the use of "legal highs" — such as so-called "synthetic" marijuana, "bath salts" and the like — is lower in Portugal than in any of the other countries for which reliable data exists. National mortality rates vary considerably and are influenced by factors such as prevalence and patterns of drug use, particularly injecting and opioid use, the characteristics of drug-using populations, the availability and purity of the drugs, reporting practices and provision of services. Rates of over 40 deaths per million were reported in seven countries, with the highest rates reported in Estonia (127 per million), Norway (70 per million) and Sweden (70 per million). Although national differences in coding and reporting practices, as well as possible under-reporting, make it difficult to compare countries, analysing trends over time within individual countries is valuable" — Ireland had a rate of 58 and the UK was at 45. 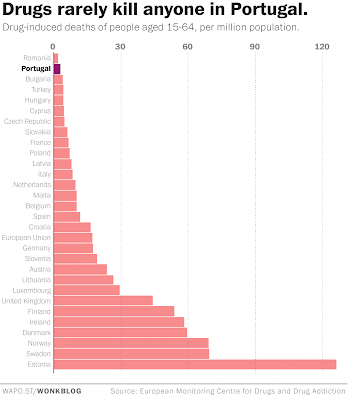 Romania was 2 and Portugal was at 3 drug overdose deaths per million citizens. The Netherlands was at 10 and the EU average was 17 per million. In 2012, a general population survey was conducted on a sample of 5,355 inhabitants in Portugal aged 15–64. Although cannabis remains the most frequently used illicit substance, followed by ecstasy and cocaine, the latest study indicates that the use of illicit substances in Portugal since 2007 might be on the decline (lifetime prevalence of any illicit substance among adults was 12.0 % in 2007 and 9.5 % in 2012; among young adults in 2007 it was 17.4 % and in 2012 it was 14.5 %). In 2012 about 9.4 % of 15-to 64-year-olds had ever tried cannabis, 2.7 % had used cannabis in the last 12 month and 1.7 % in the past month, compared to 2007 when cannabis use prevalence rates were reported at 11.7 %, 3.6 % and 2.4 % respectively. Ecstasy and cocaine have emerged as the second and third most prevalent illicit substances, with lifetime prevalence rates at 1.3 % and 1.2 %, and broader differentiation in prevalence rates among young adults is noted. Use of illicit substances in general is more prevalent among 15- to 34-year-olds. The latest study indicates a slight increase in recent use of LSD among all adults, and also among 15- to 34-year-olds; however, the overall prevalence of LSD remains low. All studies confirmed that males more frequently than females use illicit substances; however, there are some indications that females present higher continuity rates for cannabis, ecstasy and hallucinogenic mushrooms use than men. The latest study also examined prevalence of non-controlled new psychoactive substances. In 2012 around 0.4 % of all respondents and 0.9 % of young adults reported trying a new psychoactive substance at least once in their lifetime."